Langkawi is the premier island destination in Malaysia. This beautiful tropical archipelago surrounded by an azure sea has an unbeatable combination of sun, surf and sand as well as international beachfront resorts, iconic restaurants and easy access by flight from Kuala Lumpur and Penang. There are also hidden charms to be explored by taking a sunset cruise around the offshore islets or exploring the natural attractions on land. The Langkawi wetlands are particularly scenic as steep limestone walls rise from the mangrove-lined mudflats. They are home to various species of mangroves and rare cycads. For slowing down the pace there are the picturesque beaches of Pantai Cenang, Datai Bay with Pantai Tengah. For holidaymakers looking for more active pursuits, there is diving around the four small coral islands just south of Langkawi where there is also a large floating pontoon facility offering snorkelling for all the family. As well as other watersports, including parasailing and kayaking, there’s jungle trekking, mountain climbing, caving, fishing or taking an adventurous journey through the rainforest canopy all to be explored. 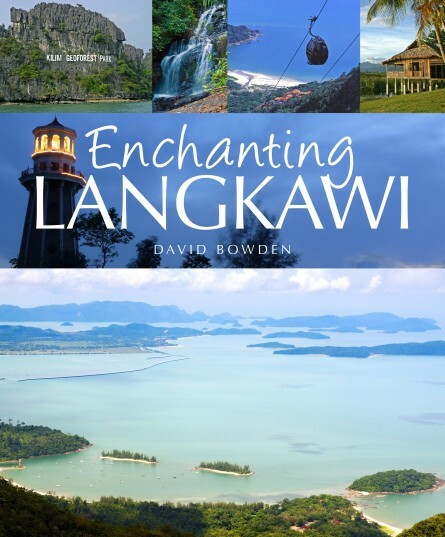 Enchanting Langkawi reveals all of the scenic wonders and adventure opportunities that make Langkawi so special, to provide both a guide to and a souvenir of a memorable holiday. David Bowden is a freelance journalist based in Malaysia, specializing in travel and the environment. While Australian, he’s been living in Asia longer than he can remember, and returns to his home country as a tourist. He’s the author of Enchanting Borneo, Enchanting Malaysia and Enchanting Singapore also in this series.